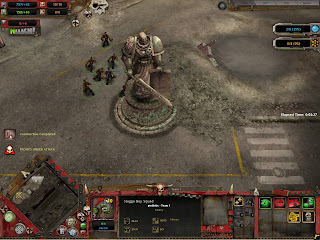 When Dawn of War II: Chaos Rising came out earlier this year I voraciously played through the campaign avoiding corruption, with the intent of replaying Dawn of War II to create another character to play in Chaos Rising as corrupt as possible. Then I decided to play through all the Dawn of War campaigns. And then I got sidetracked by other games. Seriously, if I had an unlimited budget I’d have gaming ADHD. I’m not making light of ADHD, I’m just saying that if I could play any game I wanted to and money was no object, I’d waste away in front of my computer. For the sake of the games I love it’s a good thing I have that limited budget so I can spend the time playing them that they deserve. So then I decided that since I was playing through all the campaigns I was going to review each single player campaign looking at how they are in context to when they came out, how they stack up to the other Dawn of War games, and how well they have aged. All leading up to the release of Retribution in March of next year. Back to Dawn of War, I just finished the first campaign and I have to say that for an older game (it was released in 2004) it actually holds up nicely in game mechanics and graphics, but the story isn’t very polished and that’s a downfall for the campaign. However, looking at it in a historical perspective (which is weird considering it’s a computer game) it was a great starting point. Also compared to other RTS games of the time, it does stand on its own fairly well. 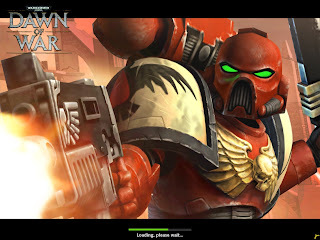 I’ve tried to look at this game with as unbiased an eye as possible, but anyone who is familiar with site knows my introduction to Warhammer 40K came through Dawn of War. This is the game that opened up the world of 40K to me, and made me start to think about considering getting into the game. And while there was also peer pressure, threats against my life, and the well being of my family that also played into my decision (i.e. my buddy Steve) , Dawn of War is a game that I hold dear to my Waaagh! loving heart. One other thing to mention before digging into the game, Dawn of War also introduced the Blood Raven chapter of Space Marines into 40K. Well, technically they were featured in the August 2004 White Dwarf first, but that was in anticipation of the game’s release in September. The Blood Ravens are important to this site, because there are two chapters of Space Marines my Orks generally face. My friend Chis plays Space Wolves, and my aforementioned friend Steve plays Blood Ravens. Now I could put in a joke that under Steve’s guidance the Blood Ravens are far less successful on the tabletop than they are on my computer screen, but that would just be mean. Besides, what I was going to say, is that the Blood Ravens (through association in Dawn of War and tabletop) have my second favorite chapter fluff behind the Dark Angels. I find their backstory of not knowing their founding chapter, yet valuing knowledge so highly to be deliciously ironic. Add to that their potential Chaos chapter roots and the internal corruption they’ve dealt with and it’s a pretty cool story. But that’s just a personal preference thing. I want to start by looking at Dawn of War as a computer game. Since it’s a Real Time Strategy game, the first thing that needs to be dealt with is how it compares to Starcraft. I’ve got some friends whom I recently pressured and begged to get into Dawn of War II, and they like to take shots at me that it reminds them a lot of Starcraft. They do this because they know I’m at my desk cringing in bitterness every time they refer to the Tyranids as the Zerg (they also continually refer to the Eldar as Elves…and I call myself a neophyte). I’m glad they jumped on board the Dawn of War bandwagon with Dawn of War II, because the first Dawn of War is in an odd place when it comes to Starcraft. Dawn of War would not exist without Starcraft, and it does have heavy influences of Starcraft as an RTS, which heightens the fact that Starcraft wouldn’t exist without Warhammer 40,000 because it stole borrowed so much from 40K. Dawn of War is this weird hybrid child that takes the source material of Warhammer 40K and applies it to the RTS conceits that were really put into science fiction effectively by Starcraft. So it’s a 40K game that resembles a game that resembles 40K. Like I said, an odd place, and one that gives me a headache thinking about. 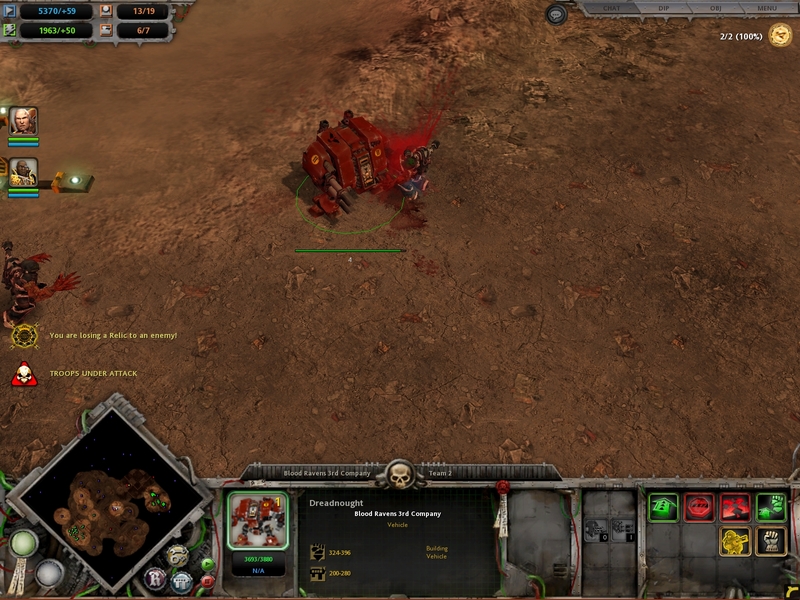 But it is fair to say that Dawn of War does resemble Starcraft, because it does. That isn’t a knock on Dawn of War, it’s actually more a testament to how good Relic did developing it. Science fiction based RTS has been defined by Starcraft, Blizzard hit a homerun with the first one, and by all accounts the second one as well. To be able to be compared to Starcraft, and still be successful in the computer market and stake out your own claim of the RTS pie shows the developers knew what they were doing. 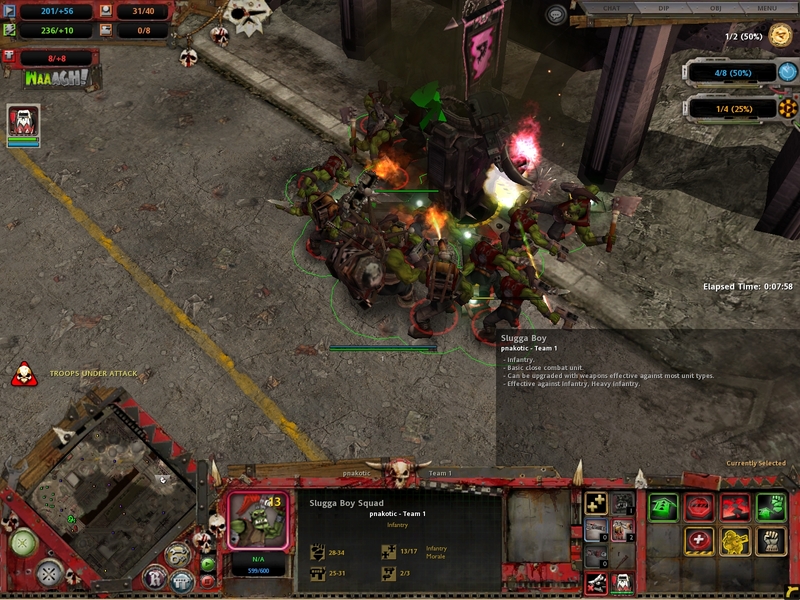 The game utilizes the standard RTS base management. You build buildings to open up new tech to research and units to build. 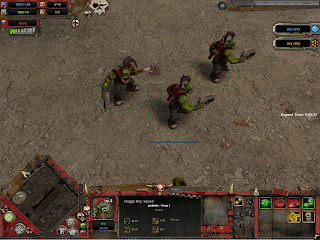 Players have to manage their bases while managing resource and power points needed for technology research, buildings, units, and unit reinforcements. 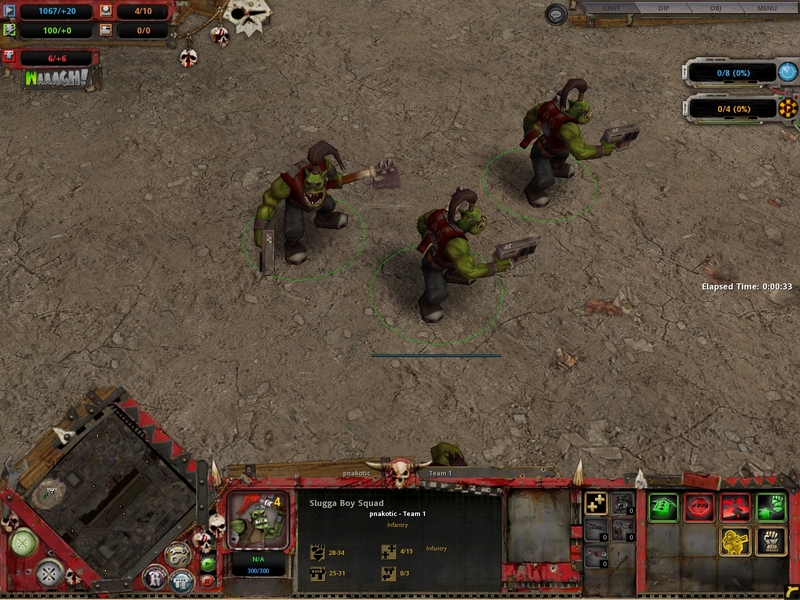 The biggest refinement added to the game was the unit reinforcement. Rather than build individual units to be grouped together, you built a unit that you could then reinforce, and add special weapons, sergeants and Commanders, Librarians, Inquisitors, or Apothecaries to. All very traditional RTS, or refined traditional RTS. I like traditional RTS games, but as I learned so many times over with Warcraft 3, at my best I’m a middle of the road player. I do well with the campaigns, but when it comes to multiplayer it’s an exercise in futility. I’m either too slow, or do the wrong build, or just can’t quite overcome the enemy forces. In my estimation traditional RTS multiplayer is a click-fest that I will play at times (with friends) but I don’t harbor deep expectations to win. I have the hope I can pull out a victory, but that’s a hollow one. So I played a round of multiplayer with the computer, and hey cool I won. But it wasn’t the multiplayer I was interested in. I wanted to play the campaign again. The story of the campaign follows Gabriel Angelos as he leads the Blood Raven Third Company on Tartarus. There they battle Orks who are overrunning the Imperial Guard, the Eldar who have a secret agenda that sets them against the Blood Ravens, and the traitorous Alpha Legion of the Chaos Marines who are looking for a powerful artifact of evil known as the Maledictum. Through the campaign the Blood Ravens slowly uncover the plan of the Alpha Legion, but in so doing find that corruption has taken root in their chapter through the Librarian Isador. After rooting out and bringing the traitor to justice the Blood Ravens then have to stop the Alpha Legion before Tartarus is engulfed in a warp storm. The biggest problem with the campaign? It’s too short. The first time I played it I was surprised it ended so quickly, and now after having played the other Dawn of War games, going back and knowing it was short still didn’t make me like the abruptness any better. They did a decent job using the campaign to introduce different units, but the story moves at a very quick pace and finishes in 11 chapters. Now the first time I played the campaign I wasn’t really familiar with a lot of the 40K fluff, so I didn’t find the story that interesting. This time around I found the story more interesting, but not as a story, but as a history of the Blood Ravens. Seeing Gabriel Angelos in action was fun, and after playing Chaos Rising it was quite fascinating to see the fall of Isador, but in the end the story really needed to be longer, with smoother transitions from one chapter or story sequence to another. Also, as I think about it, the animations to tell the stories using the in-game graphics engine weren’t the best, but I recall other RTS games of that time period having the same problem so I don’t hold that against them too much. I can understand why Relic might have hedged their bets on the campaign, after all this was the first foray into video games with Warhammer 40K after a bunch of earlier games that really weren’t that good. I’m sure there were a lot of questions about whether fans would latch onto the new game, plus it wasn’t just taking the trappings of 40K and putting them on first person shooter, this was taking a turn based strategy game and making it real time. We nerds love what we love, but we are also very protective of our beloved properties too. How would the nerds react to this take on 40K? Thankfully the changes were executed well. And combine that with stellar graphics and unit animations at the time, that still hold up for the most part today, along with utilizing a respectful if not faithful attitude to the source material made the game a hit. There’s something delightful in seeing a Dreadnaught pick up a Chaos Marine, and as the claws squeeze blood spurts out, before spinning the body and tossing it. Or to see the Space Marines kneel before a relic in what looks like thoughtful prayers to take control. Oh sure not necessarily straight with the 40K fluff, but a nice graphic touch. I'm sorry I thought you didn't care who's blood was for the Blood God. Combine that with some incredible voice work, and you have a fairly well executed RTS video game with only a few shortcomings. We said WAAAGH! and we meant it! Dawn of War works very well as a 40K game, on a few different levels. First, it’s a bloody and violent game, as one would expect 40K would be. Second, it does well to incorporate a lot of 40K into the game. 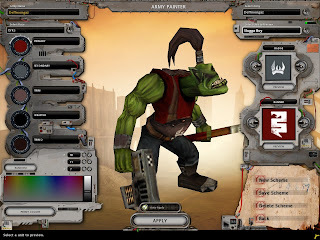 Space Marines can equip different types of guns, Orks can unleash a Waaagh! to fight more frantically. There's even an Army Painter function included in the game, allowing you to approximate whatever army you fight with for the computer. However some units are missing, and some of the things I’ve taken for granted with Dawn of War II like Stormboyz landing violently just aren’t there. If only painting my army was as easy. In the end, Dawn of War isn’t the best game in the series, but as far as starting points the series could have done much worse. It didn’t quite nail so much as approximate 40K, but it nailed it as an RTS game. Unfortunately the campaign (the reason I replayed the game in the first place) was a bit of a letdown—as I remembered it. Still it’s a great place to start, it was fun to play again, and it’s so cheap now it wouldn’t hurt to buy it if you were interested in where the Dawn of War franchise started. I use Soulstorm for this now for the added armies, but using the army painter mod you can see every unit. This has become an invaluable painting tool to me since I can quickly see what any color combination looks like.